Seed Keeper Company www.seedkeepercompany.com is coming to the Garden Club meeting in March – check out the Garden Club website for more details. 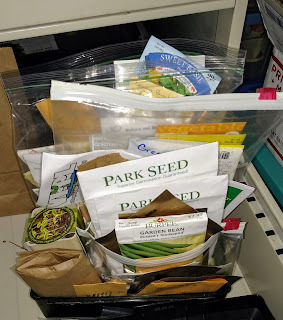 That got me thinking about my collection of seeds which is not organized at all. I do keep them in a cool dark place (bottom drawer of a filing cabinet and in a recycled plastic cat litter container.) But, as you can see, they are in envelopes, tins, plastic bags, seed packets, my own handmade seed packets, and my favorite -- paper bags. Lots of paper bags, most with a single scrolled half name of the original plant on them. And I would not call them organized. Many of these seeds are three years old or more and I felt it was time to either use them or give them away. We are having a mini seed swap at the March Garden Club Meeting where members and guests can bring seed to share or just pick up seed. 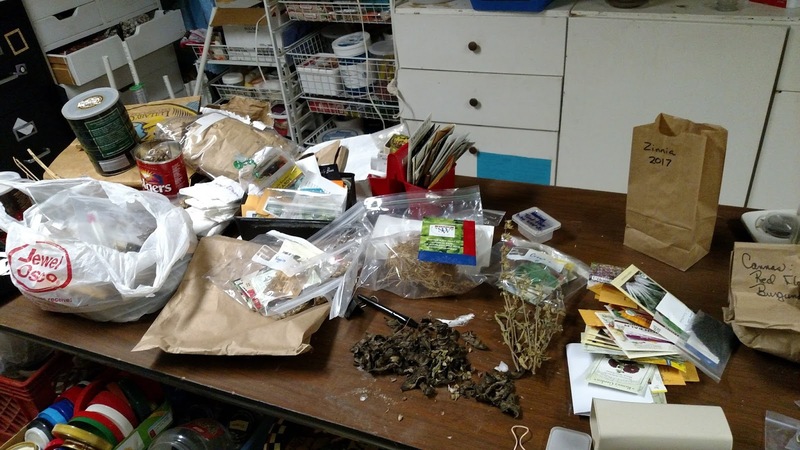 I am going to provide paper bags and coin envelopes and people can pick up a few seeds and then at the meeting learn about the history of seeds and some seed starting and preserving tips from Carol and Kerrie of Seed Keeper Company. They will also have Seed Keepers and other garden accessories available for purchase, so you can get organized too. They have a soil thermometer that I absolutely covet! How did I organize my seeds? First I took them all out of the drawer and the plastic storage container and spread them on the table. I placed those I thought were quite old to the far left so I could check the germination. The rest I sorted loosely into vegetables, herbs and flowers. And then subdivided into species as needed. At this point I check seed for germination. 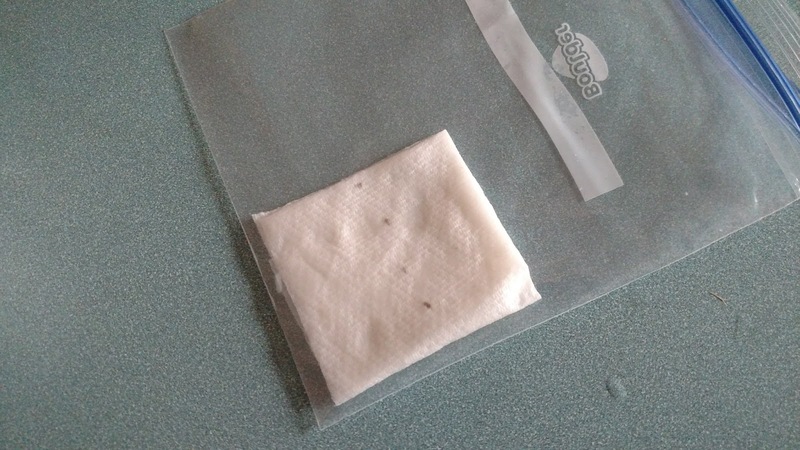 I placed 10 seeds on a damp piece of paper towel, folded it over onto the seed and placed them in a warm area (on top of my refrigerator and in my upstairs bathroom) and waited to see of they would germinate. I get a loose percentage of germination rate by how many of the 10 seeds actually germinate and can give people a loose idea of how well the seed will do for them. Since all seeds have different lengths of time they can be kept before they lose vitality this is an easy home method to check to see if you save that seed a bit too long. Then I grabbed a few reference books. If I was going to place these in bags to take to the meeting I needed to include information about the soil needs, growing habit and germination periods for the plants so others not as familiar with them as I am can enjoy them. 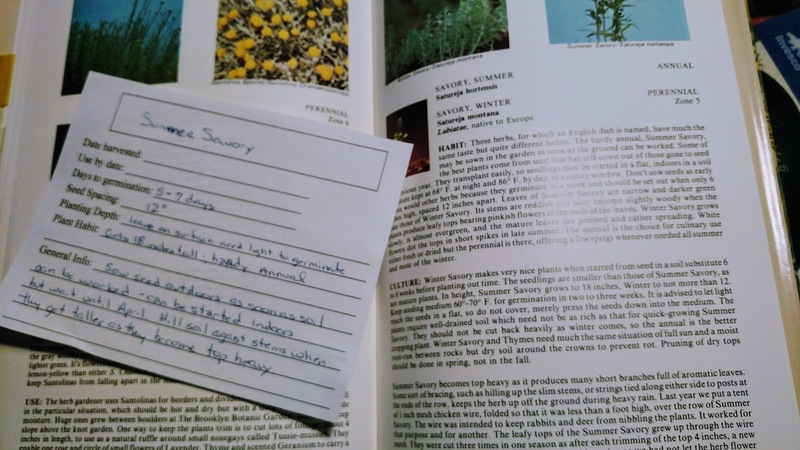 I chose to put this information on an Index sized card, rather than writing it on the bag or container, then I can transfer the seeds to different containers and never lose the information. Now only a name needs to go on the bag, box or envelope. 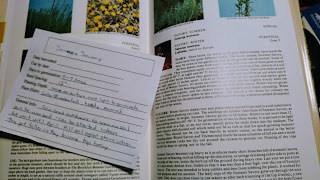 I used the Park’s Success with Herbs by Gertrude Foster as my main source for info. Nobody knew seeds like Park’s back in the day! If you want a copy of that seed info card - download this PDF! 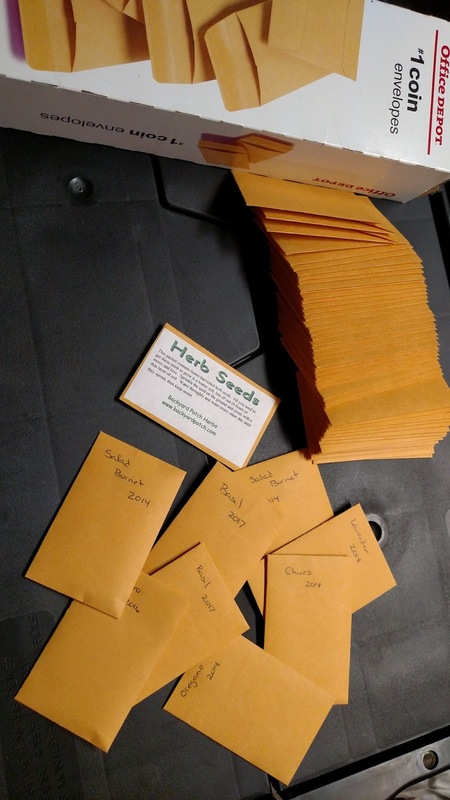 For the Swap I decided I would put a large amount into envelopes or bags and people could just pick up one small package with 10 to 20 seeds in try out at home. For those with a larger garden I also kept some seed that I had in larger amounts, in paper bags. Then they can scoop out some seed to grow. These are the finished collections of seed. I have kept a manageable amount for myself to plant both indoors and outside (back into the drawer they go.) And have two containers of seed to go to the Garden Club meeting. These are well labeled and can be used by visitors to the March Garden Club meeting to enhance their own gardens or start a new one. I would not say my seeds are organized yet, but at least they are in manageable groupings. I will get a Seed Keeper at the Garden Club Meeting and then I can file them with the information on my seed cards! Wow aren't I organized!